Pink line syndrome (PLS) has been reported in wild corals before such as Porite lutea, wherein a colored band appears between the dead and healthy tissue of a colony. We are the first to report corals showing signs of this disease in Aquarium, which was down to one hobbyiest, Robert McCombie, reporting an incident of this disease in his tank set up. Currently we only know of two species of coral which are suceptible to this disease and they are Acanthastrea and Blastomussa wellsii. In wild corals suffering from this disease, fungi have been shown associated with both healthy and diseased tissues, whilst the cyanobacterium has been shown to be present in only diseased samples, suggesting this could be a potential causal agent (Ravindran & Raghukumar 2006). 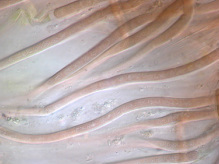 It has further been proposed that the cyanobacterium causes a tissue degenerative process triggered by increase levels of CO2 produced by the cyanobacterium. This disrupts the symbiosis between coral host and their zooxanthellae (algae) and the zooxanthellae are expelled from the tissue. Checking your parameters in your tank would be a very good way to start to try and prevent more corals contracting PLS. If CO2 is the underlying stress which causes this disease, higher than normal levels in your tank systems might cause an outbreak. As its likely to be caused by a cyanobacterium, treatment with iodine dips and or antibiotics may help.